When Leo Fender introduced the world to his newest creation the Stratocaster, nobody could possibly have known that it would change the face of contemporary music forever. In the beginning, there was just one Strat configuration with three single-coil pickups. Today there's a Strat to match everyone's budget and playing style. The Fat Strat is a modern take on a classic design with the addition of a humbucking pickup in the bridge position and special switching for a nearly infinite range of tones. 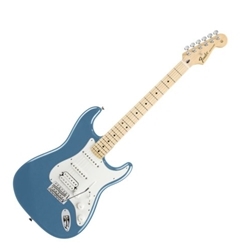 So whether you play country, blues, heavy metal, or R&B, the Fat Strat can deliver the sound you want. Like most contemporary Strats, the Fat Strat features a lightweight, comfort-contoured alder body, which has actually changed very little since the first Strats rolled off the production lines in 1954. However, this new version has shielded body cavities for quieter operation and reduced hum, which is particularly important with single-coil pickups. They sound great but can get a bit noisy at times. While there's no denying the fact that Leo Fender's guitar designs were an amazing blend of art and engineering, it was the erroneously named synchronized tremolo (it's actually a vibrato) that may well have been his most inspired bit of engineering. With it, you could bend notes or even entire chords up or down without throwing the guitar out of tune. Even though Fender has continued to improve upon the tremolo, many players simply prefer the look and feel of the original. In the Fat Strat, there's also a high-mass bridge block for improved sustain and overall tone.